The study states, “As the head tilts forward, the force seen by the neck surges to 27lb (12kg) at 15 degrees, 40lb (18kg) at 30 degrees, 49lb (22kg) at 45 degrees and 60lb (27kg) at 60 degrees”. 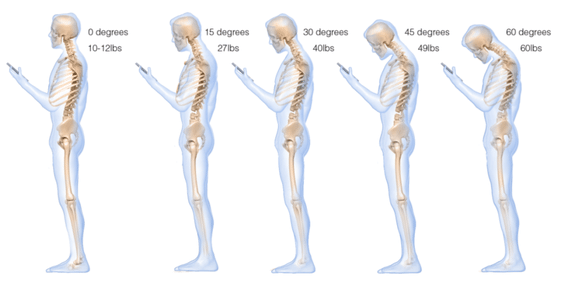 You can minimise strain on your neck by holding your phone closer to eye level to reduce neck flexion; taking regular breaks and avoiding extended periods of phone use; and monitoring your phone use with an alarm or app such as Moment. Where possible, use a desktop computer rather than a phone or tablet, and stretch regularly for the health of your spine. Ask Daniel for some stretches at your next adjustment!